It was lovely and sunny first thing this morning, so Fizz (our German Shepherd) and I gathered some stuff together and headed for The Pond, with the aim of catching some of the bigger fish I’ve seen this week. The fact that I caught my best (size/weight) Roach earlier this week had me keen to catch a bigger fish… It’s what anglers do. 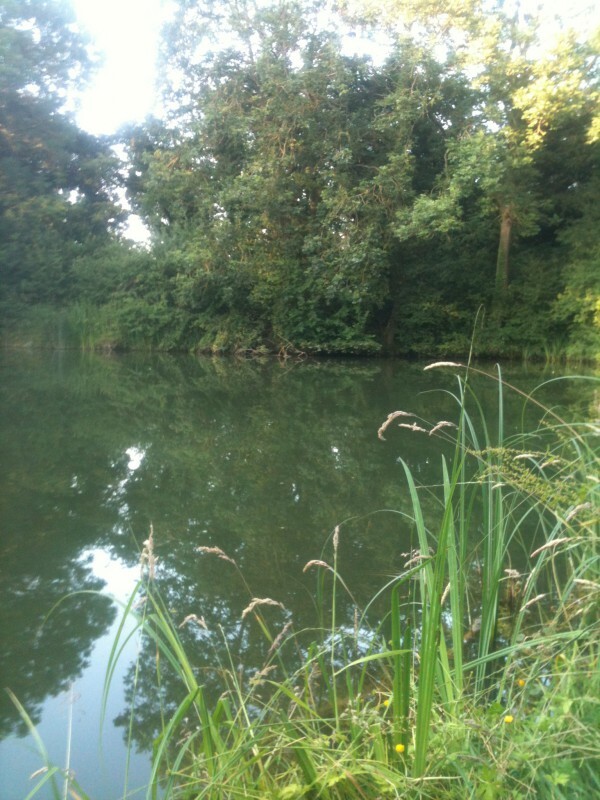 On arrival at The Pond, my usual spot appeared VERY different, as someone else had been fishing there. Now, it’s not my pond, and I have no right to claim it, but I have become a bit territorial about it. It’s my happy place, and I don’t like seeing it in a mess. Whoever had been there clearly camped out, as a large area of grass was flattened, and there was a bonfire – which was still hot – it clearly hadn’t been put out properly. There are trees all around The Pond, and I don’t want to see any damage to them, so I tried to ensure the fire was extinguished. Earlier this week, I found out what had been making lots of odd bird noises in the trees – there’s a family of smaller Birds of Prey (I’ve not seen them clearly enough to identify them) nesting there. It was a beautiful sight to see them swoop down through the trees and head out over the water. Selfish acts like leaving litter, rope, tent pegs and tools lying around really upsets me, but seeing the fire was still live really wound me up. Please think of others when you’re out and about, whatever you’re doing. Whether this left me unsettled or not, I started getting angry and upset about not catching any fish, and this upset my normal calm time at The Pond. Just being there should be enough, catching a fish of any size is the icing on the cake. As Fizz got a little unsettled, we packed up and headed off home. I’ve been reading and watching a lot of fishing material this week, learning and growing. There’s a fantastic article in this month’s Carpology about simplifying fishing, and taking it back to basics, amongst other things, and I really like this. Just being out there, watching the water and how the fish are moving, and, hopefully,catching one is what it’s all about. Nothing else. Plotting out a much bigger post about fishing adventures and learning to let go… up later this week. Go exploring and be happy.